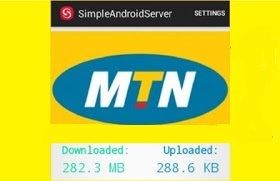 This article features the latest MTN Simple Server download and settings for PC. Today, I will share with you on how you will be able to use MTN BIS on any PC. I heard about it, I gave it a try and it worked very well. This trick rocks with simple server installed on your PC. I'm sorry I didn't show it to you on time, I was busy with some works, so I couldn't write it here, but now I'm here with it and it's still working. Without wasting time here, Lets Go Onpoint. I still have very affordable and nice browsing plans I use regularly on my PC. 1. Click here to download the latest simple server app for PC. 2. Right-click and extract the downloaded zip file to your desktop. 4. Slot or insert the MTN sim you wish to use for browsing in your phone and subscribe for any of this MTN BIS. For the weekly plan, send "BBCWEEK" to "21600" and for a month, send "BBC" to "21600" without the quotes. You should get some messages that will confirm your subscription to the Blackberry plan immediately after sending the SMS. - Wait for confirmation texts before you remove the sim and insert in the modem. 6. Go to “Settings” on the modem dashboard and create/modify the APN. 8. Click “OK” when you have inputted the Proxy correctly and enjoy your browsing. Can I share my PC network with my friends? Yes, you can share your PC network with your friends, just my previous post How To Turn Your Windows Pc/Laptop Into A Wi-Fi Hotspot to learn how to do it. Do you like this browsing trick and is it working for you? If Yes, kindly drop me a comment through the comment box and if you are facing any problem with the configuration, let me know and kindly share this post with your friends and tell your friends to share it with their friends. Thanks. Your post was very helpful and nice. You are welcome. Tnx for reading and appreciating my post/info, please visit always for more info like this and do well to share my posts to your friends..